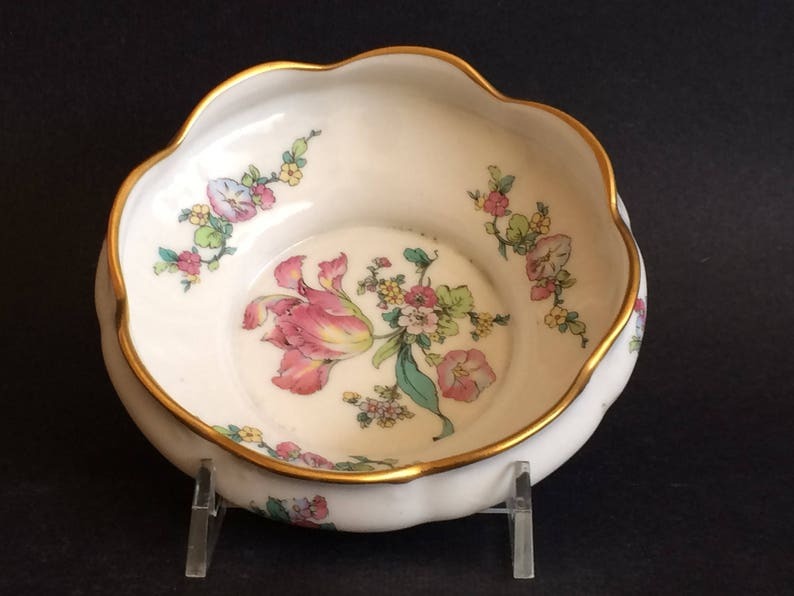 This graceful china bowl perched on its own pedestal foot is perfectly suited to add grace to your surroundings while it serves food treats such as candy, nuts, olives, or condiments; or helps with holding handy vanity accessories such as cotton balls or small soaps in a bedroom or bathroom. The mark on its bottom indicates that it is a product of Concorde China in the U.S.A. which seems to have had a limited run based on the small number of pieces out there with the Concorde mark. But that actually adds to the appeal in this case -- a lovely bowl whose originality will help make special your entertaining with it, or perhaps your choice of it as a gift for a friend. At approximately 4 1/2" in diameter by 2" high Excellent condition.